After I finished listening to This Dark Road to Mercy, the next item on my Audible wish list was Gillian Flynn's Gone Girl. For one thing, there's a movie coming out in october with a cast that includes Ben Affleck. For another, I was starting to feel like everyone I know had already read it. 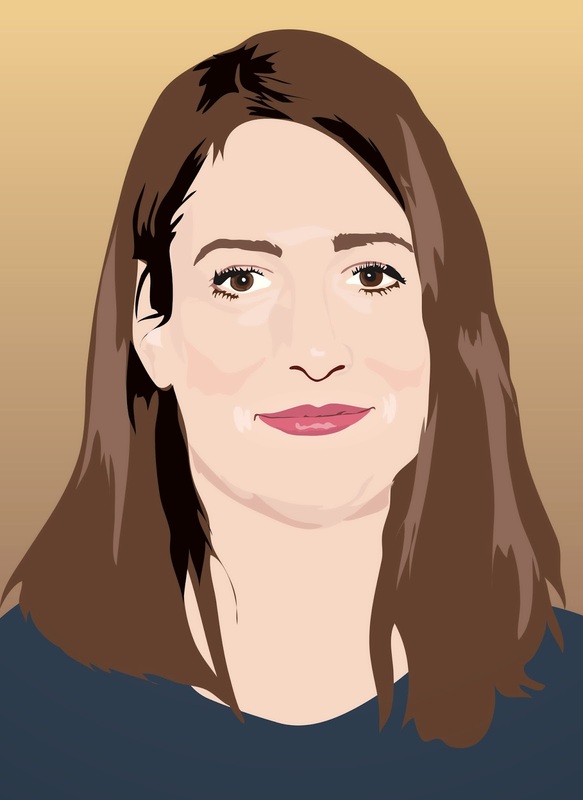 For yet another, I had drawn this kind of weird-looking graphic portrait of Gillian Flynn, and I needed to use it for something. Ok, that last one isn't true. But I acknowledge that this graphic portrait isn't my best work. Sorry, Gillian. Now, before you read on, I must warn you that there are spoilers below. So, if you're planning on reading or listening to this book, you may have to skip today's post. Now, you've been warned. So, this book was a really interesting one. Reflecting on the story structure, I'd like to break it into three parts. These parts, for me, hinge entirely on my feelings toward Amy, the story's protagonist...if you can call her a protagonist in the sense that you're rooting for her. Part one is the part in which you don't really like Amy very much and are thinking "oh, puh-lease" to about every thing she says. During this portion, she embodies the kind of girl you really hate because she talks about her relationship ALL THE TIME. In short, Amy from part one should head on over to #MyFriendsAreMarried. She is far too self-satisfied. Part two is the part where you're like "heck yes, Amy! You fake your own death! Stick it to the man! Serves him right!" When this part of Amy's character was revealed I was really excited. I was hoping this would be a Thelma and Louise sort of thing but without the whole driving off a cliff thing. But then...part two started to gradually bleed into part three, and I felt my heart sink while I realized I'd been rooting for a total psycho. Yes, part three is where you go from loving Amy for sticking it to a cheating husband by framing him for her disappearance to realizing she's a total psychopath who frames people for things practically as a part of her daily existence. I think Flynn probably did this to make the story and characters more complex, and I guess she succeeded, but I just...I wish it had all ended differently. And I hated that I actually ended up rooting for the cheating husband. Like, how did that even happen? Now, let's talk about the vocal performances. I'd like to say that when I first started listening to the audio book, I thought both the male and female readers were annoying. They both sounded smug, and I didn't like either of them. However, as the story progressed, I understood why they may have been directed to read in this particular fashion. I think the whole point was to make sure that neither of the main characters was actually likable. Well, done, Audible! You achieved your goal. For as intensely as I disliked both Nick and Amy, I have to admit that I think this was a good book. I guess having any sort of intense feelings about the characters of a book is the marker of a good read. Well, in this case, it's the sign of a good listen. So, if you made it this far and for some reason still feel the need to read or listen to the book even though I've pretty much ruined the whole thing for you, I say this: read at your own risk. You probably won't like Nick or Amy or how the book ends. But I also say that I'm going to see the movie for sure. But I think we all know it takes exactly 0 enticement for me to go to the movies. Again, to Gillian Flynn, if you're seeing this, I'm sorry about the portrait. I'm not sure what went wrong.